Mar 11 Fort Mill @ Boiling Springs ( Zaxby's Invitational) 2nd pl. The Boys Tennis Team was victorious in our first regular season match against Lancaster, 4-3. AT the end of 6 matches the score was tied 3 all. The #1 doubles team came thru to seal the match for a resounding victory. JV had 2 out of 3 wins. Back to back barn burners with the #1 doubles deciding the match score. The#2 doubles came from behind in the 3rd set tie breaker to save 4 match points to win and tie the score at 3 all. 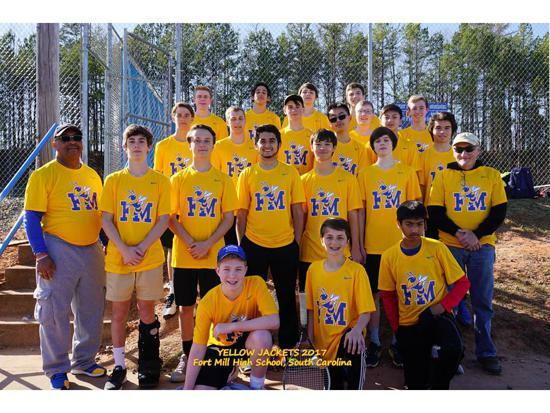 The Yellow Jackets came in close seconds by 1 in the Zaxby's Tournament on Saturday. Flight winners were: #1 singles - Apoorva Mehta and #2 Doubles - Trey Robertson/Ian Weber. 3rd place in flight #4 singles - Stephen Murri. Boiling Springs won the tournament with 9 point while Fort Mill came in second with 8. The tournament came down to the #5 flight finalist to decide the match between Tejas Padmanabhan (FM) and Boiling Springs. A 3rd set tiebreaker that ended with a 10 - 8 decision in favor Boiling Springs. 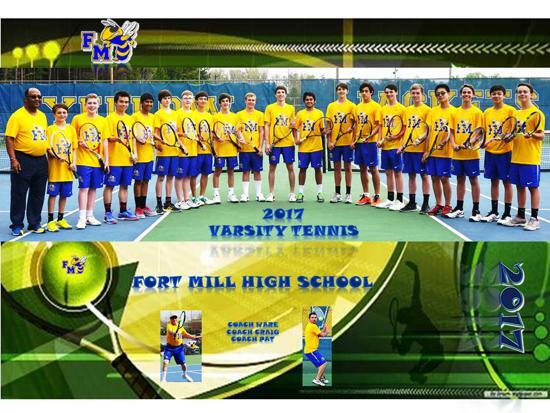 Fort Mill Tennis team defeated Northwestern 7-0 in match on Tuesday. Season record is 3 - 0. The Jackets came away with a close match today against Clover 4-3. We had strong player from the entire team. There were 2 close tied breakers before the #1 doubles were able to clinch the match at FM 4 and Clover 3. Season record is now 4-0. FMHS Boys Tennis defeated Lancaster yesterday 6-0 in an away match. Season record is now 5-0. 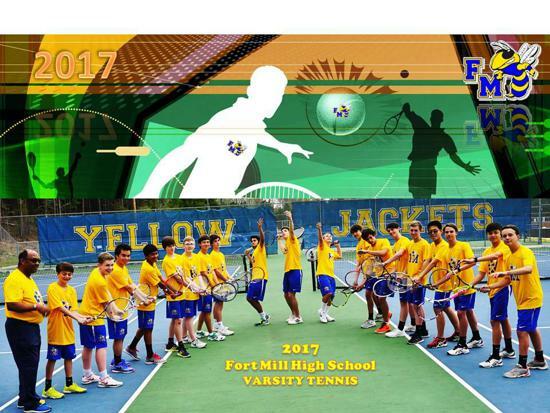 FM will travel to Rock Hill for a 5:00 match today. The FMHS Boys Tennis finished the week with a win over Rock Hill High, 6-0. The season record is now 6-0. The Boys Tennis was able to stage an upset on our home courts against Nafo today, 4-2. We had outstanding play from the entire team and was able to win without playing our #1 doubles. The Boys Tennis fell to Clover yesterday 2-4 in a close match with 3 third set tiebreakers. The Boys Tennis team fell to a strong North Carolina school, Marvin Ridge, 0-5 before the match was suspended because of rain. Season record is now 7-2. Team will play Rock Hill at home on Tuesday, 4/18/17. Boys Tennis sweep the match today, 6-0 against Rock Hill. Season record is now 8-2. The Boys Tennis lost a hard battle against Nation Ford, 2-4. Season record is now 8-3. Will play Northwestern on Monday for the last regular season match. Playoffs begin on May 27. The Boys Tennis closed out our regular season with a 6-0 win over Northwestern. Season record is now 9-2. Playoffs begin on Thursday, 4/27/17 against Byrnes at our home courts. Time is TBA. Boys Tennis fell 5-1, but not without a hard fight. Please congratulate these young men on a wonderful season.